Great Vac for the money , great suction and seems easy to deal with in my car. The Dyson V6 Handheld Vacuum are good. Thank you! Stellar! Super fast ship. Great buy. Thanks! Quick ship. Item was as described. Very pleased w transaction. Painless transaction, but the item was defective. Refused to change shipping address when requested 3 minutes after placing order. Many scratches and low battery time(It lasts 5-10min), but motor works well. Item for sale was to be delivered by 9-7-18. Item still not shipped. It's very practical, light and easy to use, accessories can be snapped on and off easily. Can be easily used one handed to clean small corners. And with the short extension tube you can use it with two hands when you need to get deep between seats or furniture. When I received the box in the mail, I was thinking it was pretty small for a vacuum. The whole unit is plastic which brings down the weight, but these things are not cheap. The suction is OK at best and my handheld $49.00 Shark Pet vacuum has more suction and last a lot longer on a charge. So much for Dyson, as I guess the guy on TV is right is right as the Shark out performs the Dyson. There seem to be 20 different Dyson handhelds on the market. I bought this one based on the price and the recommendation from wirecutter.com, rather than an extensive comparison of the various models, but it turned out to be a good decision. 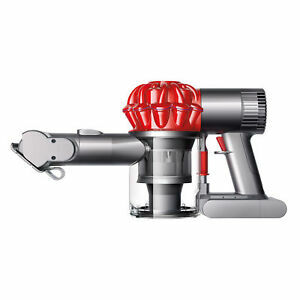 It's got great suction, two power levels and a bunch of nice attachments. I never timed the battery life, but of all the times I've used it it's only died on me once while I was still using it. The only thing I wish it came with is a wall mount. Dyson makes a great product this vacuum has more than enough power to clean your car, the battery run time at 20 minutes is long enough to clean your car's interior if you need more time than that then you need to clean more often.The tools included allow you to get into any tight spaces to clean them properly.Dysons are not cheap but you definitely get what you pay for. Good vacuum with lots of attachments. Vacuum has good power and cleans well. Concerned with amount of cleaning on one recharge. Did not do well the first time out. Placed back on charger to make sure I had a full charge.